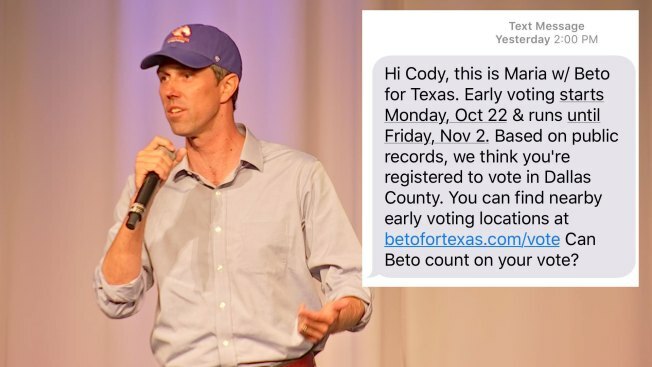 U.S. Rep. Beto O’Rourke's Senate campaign has been hit with a class action lawsuit, filed in North Texas, over unwanted text messages sent to registered voters in the state. The suit was filed Friday in the U.S. Northern District of Texas by a Collin County resident. 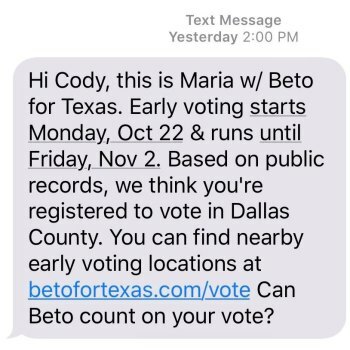 The plaintiff claims that he was sent at least nine different text messages to two separate cellphones by representatives of Beto for Texas, the campaign for U.S. Rep. Beto O’Rourke (D–El Paso) who is running for the U.S. Senate against Republican incumbent Sen. Ted Cruz. A message similar to one the plaintiff describes reads like the message to the right. The plaintiff claims that the messages are a violation of the Telephone Consumer Protection Act, which is meant to restrict the use of automated messages. A spokesperson for the O’Rourke campaign said they have done nothing wrong. "Our grassroots volunteer program with thousands of Texans canvassing, phone banking, texting, and organizing is the largest this state has seen. It is fully compliant with the law,” the spokesperson noted in a statement to NBC DFW.